Can You Hear the Higgs? Have you ever wondered what one of the greatest scientific discoveries of our time sounds like? Wonder no longer! After the announcement of the Higgs boson discoveries last week, researcher Domenico Vicinanza immediately went to work sonifiying the data. Now that the general populous can finally hear what the Higgs boson evidence sounds like, hopefully all of us can understand the data leading to this momentous discovery. Could the mysteries of the universe be holding a waltz beat? How about a jazz rhythm? R&B? Pop? Country? Turns out the score has a distinctly latin flair, similar to a habanera beat. 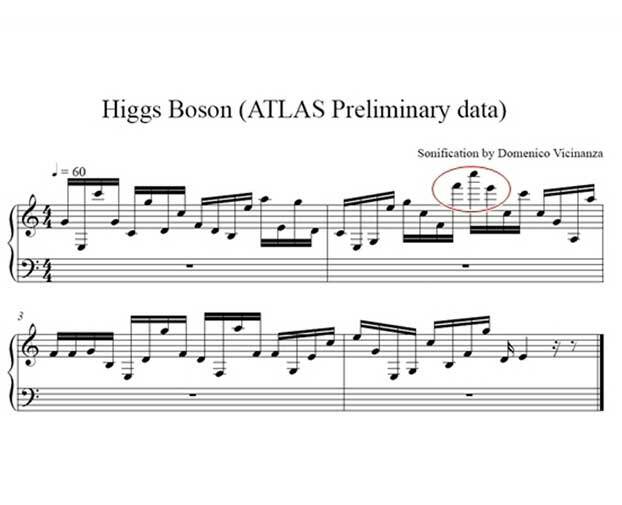 Can you pick out which note marks the Higgs in this recording? Sonification is a form of auditory display, used to convey information via non-speech audio. One of the earliest and most successful applications of sonification is the Geiger counter which makes a clicking sound when exposed to any ionized radiation. Clicks increase in frequency and amount the closer you get to the source of the radiation, effectively turning non-visible data into an immediate response in the brain. A geekier pop culture example of sonification occurs in Close Encounters of the Third Kind , where scientists use sound and lights to communicate with the aliens that come to Earth. Sonification is a relatively new science only existing since the early 1900’s and only formally recognized as an independent discipline in 1992 when the International Community for Auditory Display (ICAD) was founded. So, is sonification simply assigning pretty notes to make the data sound good? No! Researchers scour the experimental data, mapping intervals found in the original data to corresponding intervals in a melodic tune. As interval values increase or decrease, the pitch is adjusted accordingly. This allows them to create a musical score solely from the experimental data. This number crunching takes a huge amount of computer power and generally has to be coded from scratch for each individual purpose. In fact, in order to process the Higgs data, researchers utilized the pan-European GÉANT network, a high-speed research network in Europe currently operating at up to 40Gbps, and the EGI computing grid that links multiple computers in different locations together to increase computational abilities. I always knew that music was a doorway to knowledge, but I never considered that it could be used to actually study particle physics before. I’m really looking forward to hearing what other discoveries can be made through the use of sonification on hard scientific data.